Stobi, town from the ancient period, is the most famous archeological location in the Republic of Macedonia. Stobi lies on the place where the river Crna (Erigon) goes into the river Vardar (Axious). There it is, 68 km from the Macedonian capital Skopje, 20 from Veles, 86 km from Gevgelija and 160 km north-western from Solun (Thessaloniki), on the main road that leads from Danube, to the Aegean Sea. With this location Stobi was important strategic, war and merchant town in the ancient period. Stobi has 3 low terraces that leads down to the river Crna and walls with towers and gates. Between the Church and the Basilica in the village Palikura are located the necropolis from the roman, late ancient times and middle ages. 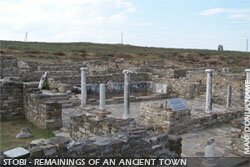 The town is first mentioned in 197 BC, but archeologist found older things and buildings, dating from 7th and maybe 6th century BC. The first archeological researches started the Museum of Belgrade in 1924 to 1936 (period of Serbian rule in Macedonia). Then the researches goes on with stops until 1940. With this researches were discovered the known urban part of late ancient Stobi with public and private buildings. Then were discovered the Theatre and mostly church objects located in the central and western part of the ancient town. In the period of the Second World War the researches became more intensive. By this researches were discovered late Hellenistic graves in the big residence known as Palace of Peristery. In the civil basilica in the two down parts was discovered archaic material and in the central basilica the older part of Sinanoga 2nd. In the north basilica were discovered architectonic structures and 23 Slavic graves. The most intensive researches were made in the period 1970-1980 by Yugoslav and American archeologists. In this period were discovered more buildings and and were made new researches in the western necropolis, Casa Romana and in the aqueduct network of Stobi. And also more mosaics saw the sun again. Final researches were made in period from 1981 to 1988 in the Episcopacy basilica. The researches made in Stobi and the things found confirmed the religion, culture and the war style of live of its population. Simple, Stobi in the history was important town in the period between 3rd century BC and 6th century of new era. Then with incoming of the Romans Stobi was capital of the Roman province Macedonia 2nd (Macedonia was divided on 4 provinces). And finally in the 6th century the city get under Slavic rule. 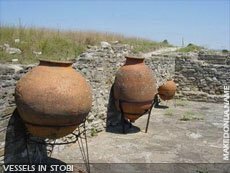 The ancient town of Stobi was first mentioned in the year of 197 BC by Livius. He mentioned that Stobi has been located on an angle between the rivers Crna and Vardar, when Philip 5th king of Macedonia, defeated the Dardanians. According the archeologists the town has been found in the Hellenistic period, not much before the period of authority of Philip 5th. There were found bronze statues from the classical and the archaic period, as ceramic things from Neolithic time. In the year of 168 BC, when the Romans defeated Perseius, Macedonia was divided on 4 areas with kept temporary independence. In 148 BC Macedonia lost the independence and becomes a Roman province. In the period of Augustus (31 BC-14 AD) the town gets larger size and much more population. Most of the Hellenistic graves have been berried with land and on them raised new buildings. The town was raising to south and west. Witness of the fast raising of Stobi are the 55 graves discovered in the western necropolis in 1970/1971. The town gets larger with the status as municipium given in the year 69 AD. In this period was started of making coins and on them written Municipium Stobensium. The citizens of Stobi enjoyed Ius Italicum and were citizens of Rome, and belonged to the tribes Aemila and Tromentina. The early and the late Roman period are the best periods of the history of Stobi. From this period were found a Grand Palace, not far away from the eastern wall, which contains beautiful frescoes. Also from the religious buildings was discovered the temple of Nemeza (Nemezis) in the theatre. But the citizens of Stobi also had respect for Higia and Telesfor, Artemida Lohia, Apolon Clarious, Jupiterius, Dionisius and Hera. The most important monument from the Roman time is the theatre, built in the 3rd century AD. In the old Christian period Stobi was, also important and influence town. The town was episcopacy seat from 325 AD, when the episcope Budius took part in the Nikea gathering. There is a small number of the towns from late ancient and old Christian time that kept big number of buildings and mosaics, such as Stobi. 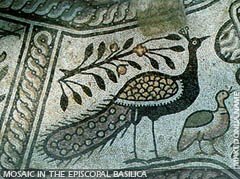 In the period of the 4th- 5th century were built several big churches and known for their inside decoration, featured by mosaics and frescoes. Decorative mosaics can be found also in a private luxury buildings from the late ancient time, such as Palaces of Theodosius, Policharmosius and Peristerius. The new archeological researches proved that all dicovered old Christian basilicas were built on ancient buildings. The basilicas discovered out of the town make promises of new archeological researches. The Christianity in Stobi has been early organized. Stobi at the end of the 4th century raised in list of Mitropoly which had 3 eparchies: Stobian, Bargalska and Zaparska. By the division of Macedonia, Stobi became capital of Macedonia Salutaris. The Emperor Theodosius 1st, stayed in Stobi in 388 AD. From the episcopes of Stobi famous are: the episcope Budius, who took part in the Nikea gathering in 325, Nikola - Chalkedon gathering in 451, Phoka - Constantinople gathering in 553, gathering, Jovan - Constantinople gathering in 680 and Margarit - Second Sinod in 692. In Stobi in the 3rd century existed and Juice community, when Policharmosius built sinanoga which was destryed in the time of Theodosius 1st visiting in 388. In the second half of the 5th century started the big accidents and troubles for this town. In 479 AD, the town was robbed by Theodork, Ostrogothic king. The citizens reconstructed it but it was struck by an powerful earthquake in 518 AD. The big Avaro-Slavic invasions in the 6th century totally ruined Stobi. From this period have been discovered coins of Justinius 2nd (569-570) in the buildings of the Acropolis, located south of the Episcopacy basilica. In 1014 Stobi was ruined again but this time from the army of the Byzantine emperor Vasilius 2nd. Between the North and the Central basilica have been discovered several graves. In 1955 in the southern part of the north basilica have been discovered 23 Slavic graves, dating from 9th-12th century. The Slavic graves are telling us that the area near Stobi and Stobi had Slavic population. 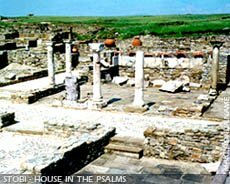 Stobi North Basilica: The church is three part basilica, with narthex, egzonarthex and atrium. The central part is separated by colonies. There was a Bapstisterium on north part. The church which is built on old building, can be entered from the street Via Principalis Inferior. Main material of the atrium construction is marble. The church is built at the beginning of the 5th century. In the southern part and southern of the church were discovered 23 Slavic graves, dating from 9th-12th century. Stobi Civil Basilica: This object is located southern of the north basilica, and discovered in 1937. Intensive researches made in 1956/1957 when were discovered seven building phases. Under the most building phases was discovered Hellenistic material from 3rd-2nd century BC. 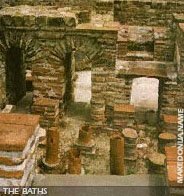 Stobi Little Bath (Thermae minores): The little bath is located between the civil and the north basilica. It is late ancient building. It has a pool and a double room. The construction is made of blocks. Stobi Central Basilica and Sinagoga: The basilica has three parts and can be entered from the street Via Principalis. It is built on Sinagoga at the beginning of the 5th century and has two building phases. The floor of the Sinagoga was discovered 1,5 meters under the level of the central basilica. Dating from the 4th century and it was built on older Sinagoga from 3rd century, created by the father of the Sinagoga of Stobi Tiberius Claudius Polycharmos. Here were discovered two vases from the period 121-125. The Hellenistic part lies on the prehistoric part in the level of the river Crna. Stobi House of the Psalms: It is located south in front of the central basilica (on the picture). It has central room, room with colonnades, a big pool and columns in the western part of the yard. The floor of the central room has a mosaics. It was discovered that this building is a residence, church property. From the residence can be entered in one of the Sinagoges. It has been built on ancient building. Stobi Via Axia: Via Axia is one of the main streets in Stobi. Its oriented east-west and its discovered only small part of the street. Main Stobi Public Fountain (Well): It is located on a small square created by the streets Via Axia and Via Principalis Inferior. Stobi Big Bath (Magnae Thermae): It was discovered in 1931/1932. It has a big room, swimming pool made of marble blocks. At this building were noticed many building phases and can be entered from the street Via Axia. The reconstructed bath has been in use in the late 6th century. Inside was discovered a statue. Stobi Via Principalis Inferior: The street has orientation north-south and it is located from the central basilica to the main town fountain, then to house of Partenius, Palace of Theodosius and the house of Psalms. Stobi House of Peristerius: This is a big living complex for several families and also has rooms for shops. The Peristerius family owned the rooms in the southern part of the complex. The central part of this complex is yard under open sky, with fountains on the western side. In the eastern part are excellent kept the floor mosaics. In the middle there is a fountain made of marble. The all complex and the mosaics are dating from the late 4th or the early 5th century. Stobi Via Theodosia: This street is parallel to Via Axia and its located between the house of Peristerius and the palace of Theodosius. Stobi Palace of Theodosius: Eastern from the street Via Theodosia is located for now one of the most luxury discovered buildings in Stobi. In this palace stayed the emperor Theodosius 1st in the time of his visit of Stobi. Because the name of the owner of this palace is not known, it is called palace of Theodosius for memo of the emperor visit of Stobi. This luxury building has plan of of the Latin letter L and can be entered from 3 streets. The floor is covered with marble blocks and the peristyle with mosaics in the technique opus sectile. The other rooms are also wonderful decorated. The palace is dating from the 4th- 5th century. Stobi House of Partenius: This house is located from the southern part of the palace of Theodosius, and the both have together walls. Its built in shape of the Latin letter L and by building conception is the same but smaller than the palace of Theodosius. It is a luxury complex but not that as the palace of Theodosius. Stobi Valavica (Domus Fullonica): It is a complex of connected shops and residences, built on older objects. The name answers only of one phase of the small yard, where in the 5th century has been located a workshop for painting and for making carpets. The life of this complex starts in the 1st century and stops at the 5th and the beginning of the 6th century. Stobi Via Principalis Superior: This street is parallel with Via Principalis Inferior. Stobi Episcopacy Residence: It is located north of the Episcopacy basilica. In the 4th century this building served as Christian oratorium (place for speeches), and in the 5th century becomes an episcopacy residence. Here were discovered a golden ring and bronze vase. Stobi Half circled Square: It is located north of the episcopacy basilica. It is separated from the street by a wall of the theatre seats, surrounded by a colonnades. In the middle there is a base of big monument. The forum is built in the 4th - 5th century. Stobi Via Sacra: This street leads from Porta Heraklea to the square. On the southern side the is colonnade built of theatre parts. Stobi Episcopacy Basilica: The episcopacy basilica or the church of the episcope Philip is built on terrace. This monument is basilica with 3 parts narthex, egzonarthex and atrium. The central part is separated from the others with two colonnades. There is a luxury interior with white marble, mosaic floors and marble blocks. There are frescoes on the walls. South of the basilica in 1970/1971 was discovered baspsterium with cupola. There are floor mosaics and frescoe walls. The episcopacy basilica is dating from the beginning of the 5th century and reconstructed at the end of the 5th and the beginning of the 6th century. Stobi Old episcopacy basilica: Located 5 meters under the episcopacy basilica. Researches made in the period of 1981/1987. The old episcopacy basilica was the first cathedral in Stobi. The object has narthex which central part is separated by 9 columns. The interior of the churches is featured by mosaic floors and frescoes on the walls. The object has two building phases. 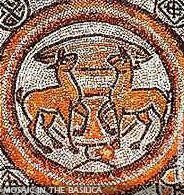 The first is dating from the first half of the 4th century and belongs to the episcope Budius, and the second of the episcope Evstatius at the end of the 4th century. Stobi Porta Heraclea: This is the main gate of Stobi. Its double and is located on the western part of the town. The time when it was built isn't known but we know of existence at 6th century. Stobi Theatre: The theatre has been built in the 2nd or in the 3rd century AD. It looks like the theaters in ancient Greece. Its one of the biggest buildings on Stobi of the Roman period. The scene, the orchestra and the skena have been built separately each other. The scene has been divided on two parts and built by white marble taken from Pletvar, Prilep. The theatre has 7634 seats. The seats have been separated for different tribes and today there are five sections of the scene with written names of five tribes. The theatre in the late 3rd century became arena for gladiator fights. In the year of 325 the gladiator fights stopped. Later on the theatre raised several houses. The up part is totally blow away, as good part of the down seats. The marble seats have been used as building material, for the porch on the street Via Sacra. And also at the main gate, Porta Heraklea. So at the end of the 4th century the theatre becomes mine for reconstruction for late ancient Stobi. Stobi Gambling Room: This building is located north of the theatre. It is called gambling room only because there were discovered Tabula Lusoria and a lot of coins for gambling. The object was discovered before the 2nd world war. It has mosaic floors. The object is basilical building, with narthex, egzonarthex... The north side is open and has architectonic structure with pool made of marble. This gambling room is from the early Roman period. And is known that existed in the period of the 5th and the 6th century. Eastern Stobi Wall: This outside wall has dimensions 400x450 meters and oriented north-south. The outside part is starring at the river Vardar and Porta Heraklea and at the river Crna on few places. It built from hit stone and stone blocks in the technique opus insertium. The walls are 2,3 meters fat. It has been made in the 3rd century and stopped being used in the late 4th or 5th century. Stobi Grave Basilica: It' located 250 meters southwestern of Porta Heraklea on the way to Palikura. It has central part and its separated with marble columns and there's a narthex on the western side. The basilica has been built on graves of one late ancient necropolis. The central part has some mosaics. On the southern side in 1937 was discovered a tomb. Stobi Palikura Basilica: It's located 2 km southern from Porta Heraklea. Researches were made in 1981/1982. The basilica has been made at the end of the 4th or at the beginning of the 5th century. It has been built on old palace of some rich man. In the narthex were discovered several old Christian and late ancient graves. There is a church with several symbols of the Christianity. With this this monument gets feudal character. From the eastern part were discovered several Slavic graves. Stobi Western Tomb: Located not far from Porta Heraklea on a location long 500 meters and which eastern part goes to the left coast of the river Crna. The southwestern part stares at the E-75 highway and the railway. The tomb was discovered in the period of the first world war in 1918, by soldiers. The western tomb is dating from the 4th- 5th century and in around him, graves. In the period of 1971 and 1972 were discovered 81 graves, dating from 1st century BC to 3rd century AD. By building an new and modern aqueduct network in 1973 were discovered 129 graves. More, 327 from graves 4th-6th century were discovered by reconstruction of the railway Gradsko-Skopje-Šivec, in 1978. The biggest number of discovered graves in the Balkan Peninsula was in the period 1992-1995, when by the work of bulldozers were discovered 1501 graves. This tomb is dating from 2nd century BC to the 5th-6th century AD. Stobi Basilica Extra Muros: Located left of the coast of the river Crna. It was discovered in 1992, a basilica with dimensions 31x16 meters. In the western part have been built little rooms near the narthex. There is a floor mosaic, damaged. And also has square fields with Christian motives. In the middle of the northern part there can be found leads of an middle age house. Also can be found base of a small middle age church. The basilica has been made in 5th-6th century AD.